We're all three of us really enjoying these. Right from the start you get deliciously evil bad guys, delightfully endearing good guys, and a good dollop of silliness. From the moment we met Marlon the street-wise bat we've been huge fans of him and his many relatives. (Under Marlon's influence, T and P have added a suave and chipper "Ciao!" to their repertoire.) One thing I appreciate is that although the books are not long and keep a light tone, still they have enough nuance not to seem overly simplistic. 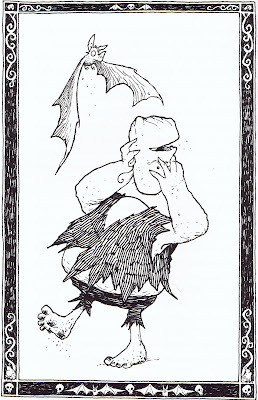 For example, the troll Gubble is introduced as an extremely stupid and incompetent servant of an evil sorceress. By the end of the first book he has decided to join the side of good and thenceforth, even though he's still just as stupid and keeps literally losing his head, his rock-solid loyalty makes him brave, heroic, and deeply loved by his friends (and us.) In another nuanced twist, the wicked step-sister is taken in by the Ancient Crones, defenders of goodness, for reformation. It's then revealed that the Ancient Crones themselves were women who were once wicked, too, and have been redeemed over many many years - food for thought for children who are used to reading that bad guys get punished in straightforward (and often merciless) ways. In these books neither the villains nor the heroes come one-size-fits-all. Multiple personalities are given a chance to shine. These books are also lots of fun to read out loud with different dramatic voices for all the different characters - just be warned: in the parts involving lots of witches and trolls my poor throat gets downright hoarse! The Serial Garden, by Joan Aiken - This is a collection of short stories about the Armitage family to whom, because of a wish made by Mrs Armitage on her wedding day, interesting and magical things are always happening, especially on Mondays. We all liked the Armitage family a lot, especially the children Mark and Harriet. We loved the incongruities and oddities that popped into their lives, and the way they encountered strange and random magic of all kinds with matter-of-fact aplomb. We enjoyed the crazy situations they found themselves in -- but we did not always enjoy the resolutions to the situations. Indeed, a number of the stories had too little resolution to satisfy us, especially P, who began to complain that the Armitages never did anything about all the things that happened to them. This isn't true, but it is true that there are stories where they merely shrug off wrongs done to them, and stories where no one ends up getting what they wanted. When Mark's mild-mannered music teacher, whom we were all fond of, was twice denied a reunion with the long-lost love of his life… once having joy snatched from him in the very last paragraph of the story after we had all been so confidently expecting the happily ever after… P developed a case of the "Jesus, Grandpa!" phenomenon. Indeed, we were all pretty annoyed about that! So although we liked the characters and enjoyed Aiken's quirky imagination, I think for a similar style but a more optimistic tone I'll try introducing T and P to some of the short stories by E. Nesbit. We rank this book good, but not one of our favorites. Mr and Mrs Bunny: Detectives Extraordinaire, by Polly Horvath - P and T were pretty dubious about this one at the beginning when the book describes Madeline's totally irresponsible hippy parents and her desire for a pair of white shoes. At that point in the story no one seemed very likeable, and Horvath's satire of the parents, while funny, almost verges on mean-spirited. 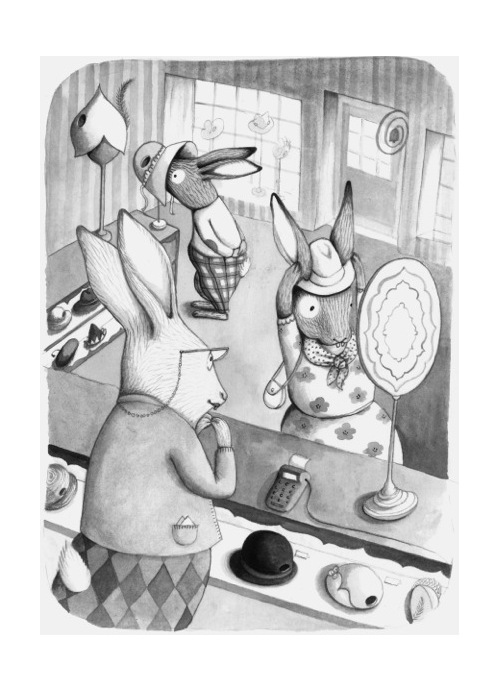 But once we met Mr and Mrs Bunny, the book became a tremendous hit with all three of us. The characters are so over-the-top goofy, so mad-cap random and ridiculous, that T and P kept repeating phrases from the book and giggling all day long. The running joke about "huge bottoms" had us all hysterical, and the personalities of the villainous foxes and marmots were wonderfully silly. For weeks we continued to repeat Mr Bunny's "zuppity zuppity" attempt to make his car go… And there were many other brilliantly nutty lines. Although Madeline herself never became a character we truly loved, she served as a sympathetic "straight man" in a world of utter absurdity. This was a fun, funny, silly, delightful adventure - and the scene with Prince Charles at the triumphant end was sheer genius. I'll never be able to see Prince Charles on the news the same way again. So, what will we be reading next? The fourth book in French's Tales from the Five Kingdoms series, of course. And after that, perhaps those Nesbit stories. I'll keep you posted as we discover more good stuff! Ah, the lovely memories of reading to my children, and even earlier, being read to by my parents. Once when I was sick in bed my father read "Twenty Thousand Leagues Under the Sea" to me. Anne's choice of recent read-alouds are all quite new. One thing I will grant: children's books are better than ever. "The Serial Garden" is not new. The stories in it were published over a range of years, but Aiken began writing them in the 30's, and many date from the 40's. However, I would agree that there's a wonderful bounty of books for children now, for all reading levels, and catering to a much wider variety of tastes than were available when I was a child, let alone generations before that. Some of the classics will never be beaten, but there are lots of new treasures being brought into the world now. It's a real delight!